Welcome to the Wednesday 1E Roundup, a weekly column looking back at the past week in the world of First Edition as well as a preview of the week ahead. If you've got an event coming up and you'd like to be featured in this column, feel free to contact me at cplaine@gmail.com or on the forums via PM to MidnightLich. A new project status update has been posted. These semi-regular updates strive to give everyone in the community information about the various First Edition projects. Past updates have included spoilers, details about project progress and staffing changes, and more. In this update, you find out all about the upcoming expansion - including the expansion name, The Cage It's been a bit delayed, and the update covers a lot of the reasons behind the delay. Beyond that, you'll find updates for the rest of the block, our scripted learn to play product, and more. March 20th, 1994 - Twenty-five (25) years ago today, the second season Deep Space 9 episode "Profit and Loss" aired on television. In this Cardassian and Quark focused story, we meet Natima Lang and several of the Cardassian dissidents that follow her, first learning that all Cardassians are not unified behind the Central Command. It's not a particularly well-loved episode, but it's one of my favorites because it allows Quark and Garak to shine, and really starts adding depth and nuance to the world of DS9. 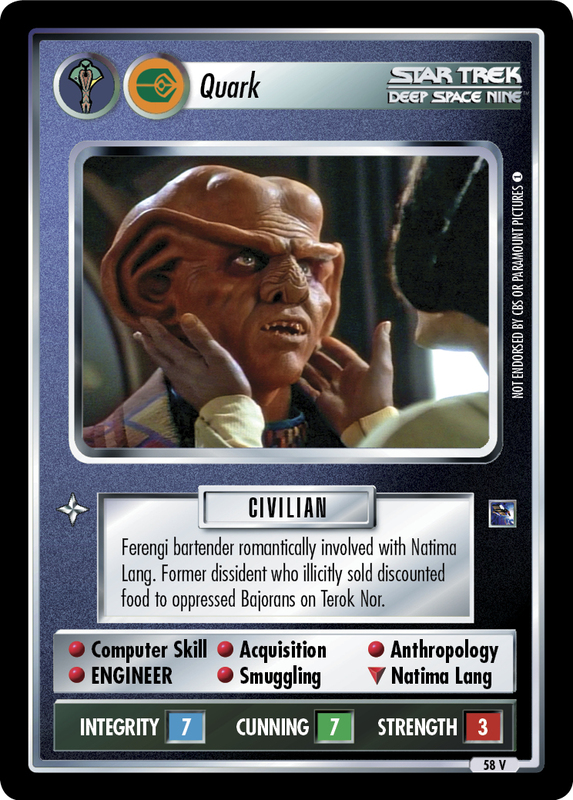 The episode is also source to a dozen First Edition cards, including versions of Quark and Sisko, Garak's Tailor Shop, the Cardassian Disruptor, Ferengi PADD, and the dissident personnel Hogue, Rekelen, and Natima Lang herself. If you haven't watched the show in awhile, it's a worthy use of an hour on this episode's 25th birthday. We didn't have any physical tournaments this past weekend, so let's take the opportunity to check in on Thomas Kamiura's (bosskamiura) online tournament. There are five (5) players battling it out in this OTF Complete Constructed event, and currently both Jon Carter (pfti) and Matthew P. (flyinhawaiian) are leading the pack with eight (8) victory points (VP) each. Michael Van Breemen (The Ninja Scot) and Sebastian Kirstein (Caretaker's Guest) both have 5 VP and Mark Napier (Squircifer) looks to have played the first round and then dropped. Stay tuned for further updates on this and other online events! If you, or anyone else out there reading these, needs any help - don't hesitate to reach out. Meanwhile, if you played in any events, scheduled or unscheduled, formal or casual, let us know! Send me an email or a private message, and I'll be happy to advertise your event or games to the world in a future column. My contact information is at the bottom of every column each week. We've got one regular tournament scheduled for this Saturday, March 23rd - an OTF Complete Constructed event in Grimsby in the United Kingdom. Hosted by Andrew Mark Alcock (uglywithglasses), there are currently four (4) pre-registered players for the event. Alex Dixon (alexd) is a power player, 12th ranked in the world, but has struggled a bit so far in 2019 after a stellar year last year. Our Creative Manager, Paddy Tye (KazonPADD) is just behind Alex at 13th, is on a four game winning streak since November and has won his only previous tournament in 2019. And when you have to regularly play against the likes of Alex and Paddy, players like admiralgary and Tony Thrustle no doubt pose their own threats, no matter what the ratings might say. Last week, we took a look at one of the visiting players preregistered for "Spring Break Masters." This event, the second Trek Masters Series this month, will be in San Diego, CA on Saturday, March 30th and will be a Silver Tin Draft. If you aren't familiar with this event, I covered it in detail two weeks ago in this column; however, in short, the players get a random starter and then draft an entire silver bordered collectors tin to build their decks. This week, let's take a look at the two local players that are preregistered with the highest ratings: Johnny Holeva (jjh) and Thomas Vineberg (Exon). Neither man has had much occasion to travel to big events outside of Southern California, but having played with them regularly over the past five years, they are top caliber players. Johnny, aside from being our Art Director, is a skilled deck builder and player in both 1E and 2E - his record has quite a few wins over the past several years, in both games. He's patient, methodical, and skilled; I can't tell you how many times he has correctly predicted a dilemma combo before even beginning his mission attempt. But more importantly, Johnny is one of the most genuinely nice people I've had the privilege to know. He's a threat to win this thing, and you'll enjoy every minute you spend with him. Similarly, Thomas Vineberg (Exon) is one of the most intelligent men I've ever met. He thinks about 1E in a way I can't, but at the same time is appreciative of any cool trick his opponents might have in their deck. Thomas has an almost encyclopedic knowledge of the game, the cards, and the weird interactions you can run into playing in First Edition. He's the player who will use the cards you've forgotten entirely about, from weird equipment and events to dilemmas you haven't seen played in years. The Silver Tin Draft is the format for Thomas to shine, because he will draft Atmospheric Ionization and use it to maximum effect. All in all, we currently have seven (7) pre-registered players for this event with a few more likely, so it's going to be a fun and different look at the world of First Edition. More and more regionals are being added to the schedule! In addition to the Florida and Michigan regionals we've covered last week, the first regional of the season is now taking place in Coquitlam, British Columbia, Canada. Hosted by Ken Tufts (Worf Son of Mogh), this event is likely to draw some of the powerhouse players of the region, including Michael Van Breemen, Richard DeLashmit (benericardus), and of course, Ken himself. Then, in April, we have the Regional events in West Melborne, Florida and Ypsilantia, Michigan with two and five players registered, respectively; but, there's plenty of time for more to do so. We'll check back in next week and see how things are shaking out. We'll keep you updated on these, and future championship events, as the season unfolds. The Will of the Collective VI ends this week with a final review of the cards. On the forums, you can take a look at the Art proof of Examine Morality (the mission for "Excalbia") and Yarnek (the personnel). This will be the last chance for the community to weigh in on these cards before they go off to playtesting for printing in a future expansion. Of course, if playtesting reveals something that will require a change, the community will be looped back in; however, assuming there is no break, this will be the finishing touch. Check in and have your say before Will of the Collective retires for this session. What is Kevin Jaeger up to? Kevin Jaeger (Hoss-Drone) has a reputation as a fearsome player; he isn't interested in peaceful coexistence and exploration, but mayhem, madness, and murder. He's recently posted that he's working on something new. As he describes it, "Where [previous decks] had a clear ideation of its methodology in game, this project is much more experimental in its decision tree." What do you think he's working on? And will it have his stated goal of making James Heaney (BCSWowbagger) sad? Deck suggestions wanted. Speaking of decks, Jason Tang (Pants o.t. Tal Shiar) is looking for suggestions for a deck. In particular, he's looking for a deck he can use for instructional purposes; hopefully, he's looking to bring some more friends and family into his playgroup. Do you have suggestions for a deck that fits the bill? How do you feel the affiliations stack up? Are you familiar with a Hurt and Heal thread? It's a way for the community to rate things by giving a -1 (hurting) and a +1 (healing) to items in an ordered list. James Heaney has started a hurt-and-heal thread to rate the power of the different affiliation and factions options in First Edition. You can post once each day, giving one a boost and one a kick down. What card is the most "1E" card in the game? Sidney Thomerson (razzy) has started discussion about which card in the game is the most quintessentially 1E card. Suggestions so far include Hero of the Empire, Persistence of Memory, The Whale Probe, and Black Hole. 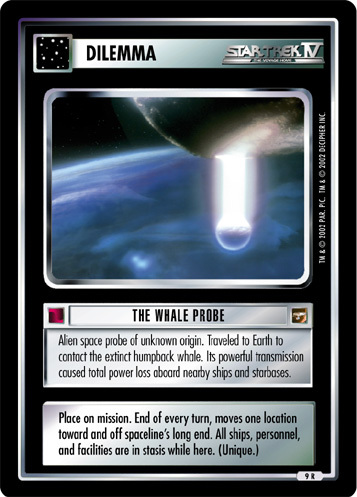 Which card just makes you smile with the sure absurdity, complexity, and Trek Sense of it all? We want to see your decks! If you read the project status update, you'll know that our new expansion - The Cage - will be coming soon. It's focused on and brings some new toys to the Original Series factions. In advance of our spoiler season, we're curious to see your favorite existing decks. Put your deck into our system and send a link to me, your author, via email - to cplaine AT gmail DOT com - or via PM to MidnightLich. We might use your deck in a preview article for the new expansion, and if we do, you'll win three (3) copies of the new release foil, Preserver Obelisk! Five years ago this week, in 2014, I continued writing my Hindsight series of articles with look at First Contact. I'm on record as not being a huge fan of how Borg were implemented in First Edition, but I respect that they are in the game and deserve to remain as part of the game. But I stand by much of what I wrote five years ago, that having Borg be different for the sake - and playing by different rules as everyone else - has added more complexity and confusion to the game as any other decision. I'd still like to go back and finish the Hindsight series one day, but for now, the ones I have completed are still available in our archives. Assign Mission Specialists (1) continues justifying its #1 seed, knocking Space-Time Portal (16) out with an 83-17 victory. After trailing in the early part of the game, underdog Battle Bridge Door (40) upset and eliminates Cytherians (9) with a 54-46 win. Q's Tent (4) proved its staying power by kicking New Arrivals (45) to the curb with a 75-25 win. In a dilemma battle for the ages, Edo Probe (28) dominated Denevan Neural Parasites (21) to win 71-29. #2 seed Dead End (2) kept Captain's Log (47) from getting going with a 79-21 victory. The dream is over for the only interrupt to make into the Sweet 16, as Alternate Universe Door (7) prevents I'm a Doctor... Not a Bricklayer (42) from moving on; final score 75-25. Defend Homeworld (3) wins over Lower Decks (14), but has to be worried about the close 58-42 score. Friendly Fire (6) wins a close dilemma vs dilemma match against Lack of Preparation (43) with a 54-46 win. Will top seed Assign Mission Specialists keep its streak alive, or can the lowest seed left - Battle Bridge Door, at 40th - take it out? Can the omnipotence of the Continuum keep Q's Tent (4) in the game when it's challenged by the equally powerful Edo Probe (28)? Does Dead End (2) have a chance against the deck enabling power of Alternate Universe Door (7)? And can Defend Homeworld (3) justify its high seed when challenged by the powerful dilemma Friendly Fire (3). Only you can decide! Eight (8) cards remain, and over the next three weeks and seven matches, we'll determine which card will be the sole 1E Survivor. It's time for you to cast your votes to decide which four cards get to battle it out for the top spot. Remember, each round you vote is an entry into a random drawing for a complete set of Tournament Promo Series N! That's all for this week's roundup of First Edition news and events. For more news, you can follow The Continuing Committee on Facebook, Twitter, or bookmark our front page. News about upcoming First Edition projects can be found in the most recent Project Status Update from December 2018. If you've got an event coming up and you'd like to be featured in this column, or if you have comments about this column's content, feel free to contact me at cplaine@gmail.com or on the forums via PM to MidnightLich. Until next week, may you expand your power in the universe and live long and prosper.